In Lake Charles, you can experience lavish costumes and the big city pageantry of Mardi Gras along with a family-friendly feel. In fact, there is a whole day dedicated to children and family activities during the celebration, and parade routes are filled with families lining the streets, so that makes Mardi Gras in Lake Charles a unique place to experience Carnival. Lake Charles has over 50 krewes and is second in the state only to New Orleans with the number of krewes participating in Mardi Gras activities. Lake Charles is also the only place in the state where the public is invited to see the ornate costumes the royal courts from all local krewes in one place, both at the Twelfth Night evening, usually held on January 6 each year, as well as the Royal Gala, held the evening before Mardi Gras day. In other parts of the state non-krewe members would have to be invited to each krewe&apos;s ball in order to see the royal court in their fine feathers! It&apos;s a nominal fee that gets the public in the door, and jeans are the comfort clothes of choice for these presentations! Also, at the Twelfth Night presentation of courts, each person walking in the door gets a piece of King Cake, and grand prizes are given out to lucky patrons. The costumes are huge at each presentation with some weighing more than 65 pounds. The court royalty has no problem wearing the costumes and even taking a bow before the Mardi Gras queens and Duke or Duchess of Misrule at the front of the stage. It&apos;s a great way to get a look at the kings, queens, royal dukes and duchesses, captains, courtesans and jesters in full costume. Mardi Gras weekend kicks off on the Friday before Mardi Gras day with the Merchants&apos; Parade, and the weekend holds all sorts of fun from gumbo cook-offs to Cajun food and music, Children&apos;s activities, various parades, and the grand finale is the Krewe of Krewes&apos; Parade on Mardi Gras day. 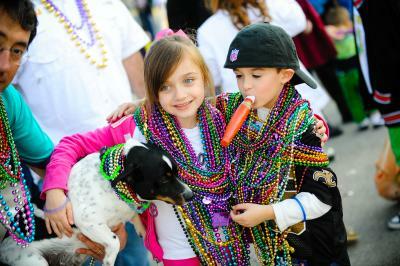 Check the Mardi Gras Calendar for full descriptions of activities and times.